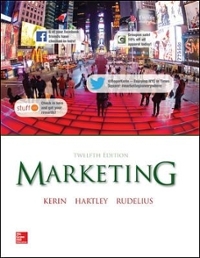 Marketing 12 Edition Marketing, 12e utilises a unique, innovative, and effective pedagogical approach. The elements of this approach have been the foundation for each edition of Marketing and serve as the core of the text and its supplements. They have evolved and adapted to changes in student learning style preferences, the growth of the marketing discipline, and the development of new instructional technologies. The distinctive features of the approach are illustrated below.High Engagement StyleEasy-to-read, conversational, high-involvement, interactive writing style that engages students through active learning techniques. Rigorous Pedagogical FrameworkPedagogy based on the use of Learning Objectives, Learning Reviews, Learning Objectives Reviews, Applying Marketing Knowledge exercises, Building Your Marketing Plan guidelines, video and written cases, and other helpful supplements.Traditional and Contemporary Coverage and ExamplesComprehensive and integrated coverage of traditional and contemporary marketing concepts supported by current and interesting examples.Integrated TechnologyThe use of powerful technical resources and learning solutions, such as Connect, LearnSmart with SmartBook, www.kerin.tv, www.kerinmarketing.com, and QR codes. Marketing Decision MakingThe use of extended examples, cases, and videos involving people making marketing decisions. Personalized MarketingVivid and accurate description of businesses, nonprofit organizations, marketing professionals (including many of whom are women and minorities), and entrepreneurs - through cases, exercises, and testimonials - that allows students to personalise marketing and identify possible career interests.Course Management System IntegrationMarketing, 12e content can be integrated with the following online course management systems: Blackboard, WebCT, eCollege, Moodle, and Desire2Learn. The goal of Marketing, 12e is to create an exceptional experience for today's students and instructors of marketing. The development of Marketing, 12e was based on a rigorous process of assessment. The outcome of this process is a text and package of learning tools that are based on engagement, leadership, and innovation in marketing education.